Everyone has their strengths and their weaknesses, some more unexpected than others. There are times when stereotypes cause people to overlook the truth about someone, and this happens often in the personality world. Each type has some impressive natural strengths, ones that help them stand out. 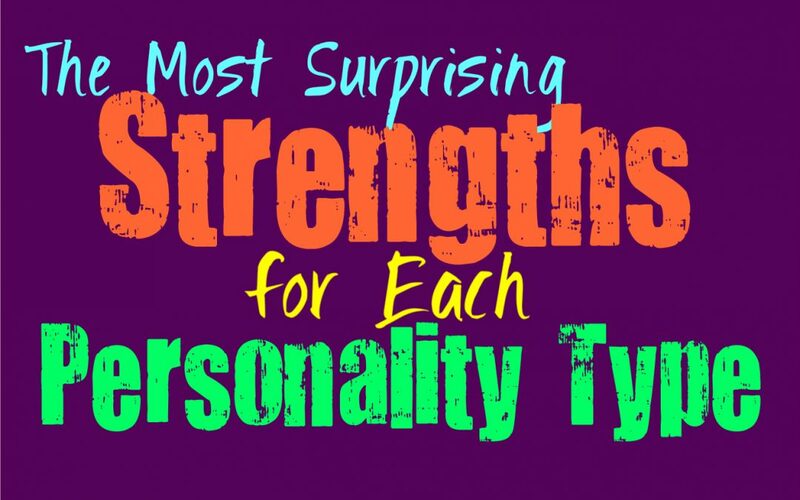 Here are the more surprising strengths for each personality type. While INFJs might be somewhat internalized and introverted people, their strengths are many and often surprising even to themselves. INFJs are great at understanding people, they can see beyond the outside shell that someone puts on. INFJs are also highly intuitive people, which gives them a sense of future outcomes and correct paths to take. This is a truly impressive ability, one that can help guide them if they learn to trust in it. Their intuitive abilities along with their natural understanding of people, helps the INFJ be a compassionate person, who is actually deeply wise in their own way (even though they would likely never believe that about themselves). ENFJs have many strengths up their sleeves, ones that can be both surprising and even expected. They are very hardworking people who want to live up to their own expectations, as well as the expectations of others. One of their most well-known strengths is their ability to care for others, and to understand their emotions almost better than their own. ENFJs can see through people and into their souls on a much deeper level than people expect. While this is a natural strength of theirs, ENFJs possess many more strengths within themselves. They are unusually strong people, who seem to be capable of pushing past so many struggles all at once. The INFPs inner emotions and sense of morals, are actually great strengths for them. While they can feel overwhelming at times, INFPs have this uncanny ability to sift through their feelings and seek out ways to understand themselves better. This gives the INFP a deep strength in their convictions and helps them to know what they want often from a young age. While achieving those desires and goals can pose a challenge, INFPs are often very aware of the things they are okay with and the things they are not. This helps them to navigate their choices in life with a sense of courage and awareness. ENFPs possess many strengths, one of which is their ability to connect with people and relate to them. ENFPs are often rather daring people, who go after the things they want in life. They are unafraid to take risks, and certainly aren’t fearful of too much change. While some people want to stay in the same position, ENFPs become bored with this type of stagnancy. The fact that ENFPs are easily bored is actually a strength, since it inspires them to live their lives with a sense of passion and seek out new experiences. INTJs possess many strengths, the greatest is their capacity for learning and understanding information. While some people can struggle to really take on too much at once, the INTJs mind is often highly capable of this. They can absorb like a sponge, while being able to discern which pieces of information are truthful and logical. INTJs also possess a strength within themselves which drives the INTJ to push forward even when they are posed with a challenge. While some people crumble under the pressure, INTJs are often inspired to take on the challenge. ENTJs possess many strengths, most of all they have an inner strength which inspires them to take on the world. ENTJs are highly motivated people and this is definitely one of their most impressive strengths. They want to achieve their goals, and once they figure out what they desire most the ENTJ will stop at nothing to get it. There is also a surprising strength in their ability to figure out what they want from life, while many people can fumble and struggle to figure this out. INTPs are creative and intuitive people, who possess many strengths within themselves. One of the most impressive strengths is the INTP ability to comprehend new information and ideas without much trouble. While some people might take much longer to really understand something, the mind of the INTP can go off in so many different directions at once. They can often comprehend many new subjects and theories, and are often impressive at keeping up where others might fall behind. There are many strengths to the ENTP, the ones people often recognize are their creative and logical capabilities. ENTPs can often come up with so many new ideas and possibilities, and they can often do this in a short amount of time. Their ability to see the many different directions something might lead, is certainly a great strength that can take them places in life. While ENTPs possess these strengths, they also have a surprising ability to connect with people when this is something they try to work on within themselves. ISTJs are often very strong- willed people, with an uncanny ability to discover what they want and go after it. ISTJs are very capable of figuring out their own internal goals, as well as unearthing the motivation to go after them. This is a strength that many people do not possess, making it truly impressive the way the ISTJ can really push themselves to make things happen. ISTJs also have a surprising strength which allows them to stand by their commitments in life, and this includes relationships. ESTJs are very strong-willed people, who seem to be capable of overcoming even the greatest of hurdles. While others find themselves cracking under too much pressure, ESTJs can often find a way to push through this. It can be difficult to really find motivation when life hands you too many struggles, yet ESTJs seem to always be capable of moving on in their lives. While others are falling apart the ESTJ picks up the slack and ensures that things get done with a sense of care and efficiency. While ISFJs are often seen as practical and kind people who are maybe even a bit timid, they have a lot more to them than just this. They are compassionate people who will do just about anything for the sake of their loved ones. When someone they love need them the ISFJ has quite a fierceness that most people do not realize at first. This inner strength allows the ISFJ to overcome just about anything in order to take care and provide for the people they love. ESFJs are very compassionate people, which is actually one of their greatest strengths. They understand the emotions of others, often without even trying. They have this ability to sense the emotions of those around them, and sometimes this doesn’t feel quite like a strength since it can be a bit overwhelming for them. ESFJs care deeply about their loved ones and will do absolutely anything to provide for them, even if this means bringing out their fierceness in order to do so. ISTPs have many strengths, but they aren’t always obvious to those around them since they keep to themselves. They are very capable of allowing things to slide off their shoulders, and this is definitely a strength. While others will feel stressed and overwhelmed, the ISTP finds a way to overcome this and keep moving forward. They don’t like allowing themselves to get too caught up the negatives in life, instead they find a way to let go of the things they don’t need to hold onto. ESTPs are adventurous people who are often willing to take truly incredible risks. Their ability to seek out excitement in their lives can be both their greatest strength and weakness. They go after what they want in the moment without allowing fear to hold them back. While this sometimes gets the ESTP into trouble, it also helps them achieve many of their goals since they don’t take the time to doubt themselves and their capabilities. ISFPs are very focused on following their hearts and their convictions, no matter what happens. This is certainly a strength and gives the ISFP an uncanny ability to hold onto their beliefs. Even when others try to make the ISFP doubt themselves, they know what they feel and what they want. Having this type of inner conviction is definitely a strength, and is something that sets the ISFP apart. The greatest strength within the ESFP is their ability to overcome their negativity. It seems that even when everything seems to be falling apart, the ESFP somehow can keep a smile on their face. This is both a beautiful and deeply surprising strength, one that might be underappreciated. It can be easily to see the worst in the world and in those around you, but for the ESFP it is quite the opposite. They seek out joy and strive to bring out the positive wherever they can.